I remember that am not spending much time on blogging these days. Also I haven't posted egg recipes since months. I thought of posting this one . Its a simple recipe and can be made by those who don't have any idea about cooking. It can also be a called a bachelor's recipe and I will hint down few tricks to keep on how to keep the masala handy always. 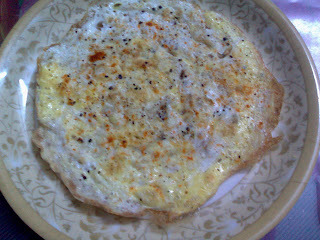 As such omelette comes in varieties these days with toppings of one's choice like tomato omelette, chutney omelette, pepper omelette and even pizza omelette. You can find such omelette outside the CST station on the eateries roads. For this recipe, the masala need to be roasted and grinded. I prefer roasting them , grinding them and then storing them in airtight pepper mill crusher. This is one recipe which my brother is always fond of since he is very favourable to spicy and easy to make recipes after reaching home. Though he never steps in kitchen for cooking, i keep things handy in case he needs something when i am not around. Hope you would like this recipe too. Do give me your valuable feedbacks. Maze - 1/2 of one whole maze. Roast all the masala ingredients and let it cool down for 5 mins. Grind it into powder and store it immediately in a airtight container or a pepper mill as per choice. In a bowl, break open a egg. Add to it the chopped onions, pepper powder, milk and salt and beat well till it get mixed. In a tawa or pan, heat oil. Pour the omelette mixture to it and spread well with help of a spatula or by just sliding down the pan with help of the handle. Now sprinkle some masala over the top of the omelette and keep it for a minute before turning or flapping it to the other side. If needed, sprinkle the masala on the other side too. When both sides are well cooked, it turns little brown. Remove and serve hot with meals. Serving suggestion: Serve hot with meals. Adding milk, makes the omelette softer and tastier. The masala can be stored in pepper mill and used when needed. It stays fresh for as long as 6 months.